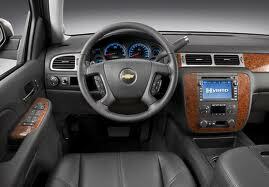 Chevrolet Tahoe Hybrid models for 2011 get the latest Gen 9.0 version of OnStar for better voice recognition. Head restraints for the second row have been revised. On 2011 Tahoe and Suburban models, a better trailer brake controller is introduced for 2011 and new chrome-clad wheels are now available. Across all Tahoe, Tahoe Hybrid and Suburban model lines, Mocha Steel Metallic is a new exterior color, while Steel Green Metallic and Ice Blue Metallic are also added to the non-hybrid Tahoe and Suburban. The Tahoe, Tahoe Hybrid and Suburban are all sturdy full-size trucks, oriented toward carrying heavy loads of passengers or cargo and towing large trailers, such as those used for boats or horses. Both V8 engines provide strong performance, while the Tahoe and Suburban handle much better-even around town-than their mammoth exterior might suggest. Ride quality and interior refinement are other high points. In addition, the Tahoe Hybrid remains one of the most efficient full-size SUVs yet fully capable of heavy loads and tow duty. 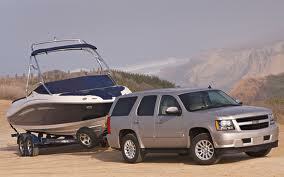 The Tahoe and Suburban are Chevrolet’s full-size SUVs. The Suburban is essentially the Tahoe’s longer-wheelbase bigger brother. 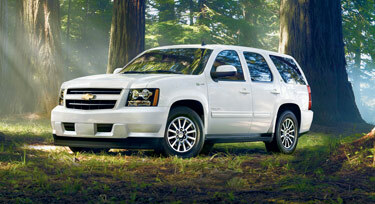 Both the Tahoe and Suburban are offered in LS, LT and LTZ models, while the Tahoe Hybrid comes in a single trim. Each of these models is available with a choice of rear- or 4-wheel drive. The Tahoe and Suburban both offer a standard 320-horsepower, 5.3-liter V8 engine paired with a 6-speed automatic transmission. The heavy-duty Suburban 2500 also offers a 6.0-liter V8 that makes 352 hp and 382 pound-feet of torque. 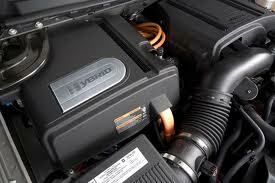 The Chevrolet Tahoe Hybrid employs GM’s 2-mode hybrid system which combines a Vortec 6.0-liter V8 engine with Active Fuel Management and a sophisticated Electrically Variable Transmission (EVT) system that employs two electric motors that engage to help power the truck for optimal efficiency. The Tahoe hybrid can operate at low speeds on electric power alone and the gasoline engine automatically stops and restarts for traffic lights and idle situations. A 300-watt nickel-metal-hydride battery pack is located under the second-row seat of the Tahoe Hybrid, maintaining the seat’s fold-forward capability. Otherwise, the Hybrid model gets a number of other changes including electric power steering, an electric air conditioning compressor and low-rolling resistance tires. Altogether, the Tahoe Hybrid achieves nearly a 30-percent improvement in efficiency over a non-hybrid, with EPA estimates of 20 mpg city and 23 mpg highway. All Tahoe and Suburban models are built on a fully boxed frame, which gives them full truck toughness and helps keep vibrations out of the cabin. A coil-over-shock front suspension and rack-and-pinion steering give the Tahoe a surprisingly good ride and reasonably responsive handling. LTZ models get a special Autoride suspension system that employs real-time, semi-active adjustable dampers to help reduce body motion. Yet in any of these models, the interior is plush and comfortable and the instrument panel is more like that of Chevy’s passenger cars and modern crossovers than like Chevrolet’s work-oriented pickup trims. Safety features don’t vary by model; each of the Tahoe and Suburban trims include GM’s StabiliTrak stability control, along with anti-lock brakes, seat-mounted front side airbags and head-curtain airbags for the first and second rows, as well as the OnStar suite of services, such as Stolen Vehicle Slowdown and Automatic Crash Response. A side blind-zone alert system is optional. Also no matter which specific model, tow ratings are strong. The Tahoe can tow up to 8,500 pounds, while the Tahoe Hybrid can tow up to 6,200 pounds and the Suburban can handle trailers up to 8,100 pounds. A heavy-duty 2500 version of the Suburban offers a tow rating of up to 9,600 pounds. Most Tahoe and Suburban models include seating for up to eight, with two buckets in front plus second and third-row bench seats good for three across, but a front bench is available on the Suburban to fit up to nine. Several upholsteries and styles are offered and both the first and second rows can be heated. Top LTZ models include upgraded wheels and chrome trim, plus a navigation system with XM satellite radio and XM NavTraffic, Bose Centerpoint surround sound system with ten speakers, heated and cooled front seats, perforated leather upholstery and extra power outlets, among many extra features. Among the noteworthy options on the Tahoe and Suburban are navigation, DVD rear entertainment, remote start, tri-zone climate control, Ultrasonic Rear Park Assist, a rearview camera system and a power-folding second-row seat.